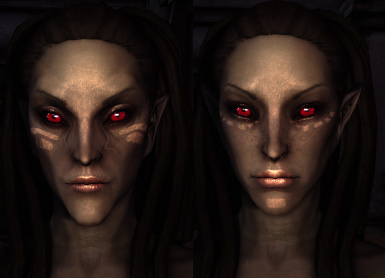 A total aesthetic but lore-adherent revamp of the elf races of Skyrim - makes elves' facial features less pointy and provides a choice over brow ridges or not. 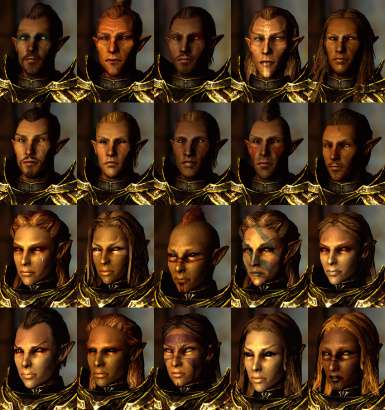 Comes with new nose and lip morphs and custom normal maps, with all elf NPCs restyled. Works with all body, skin and hair mods and vanilla Skyrim. 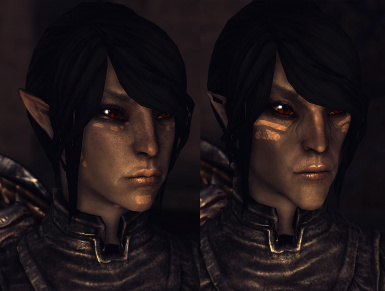 Akira Racemenu Preset Makes the Elves look better and is a Total must or my preset will not work. Any asset use is OK, also applies to other mods I've made. Knock yourself out. Translations and patches are also OK and you can freely distribute them without needing permission from me separately. 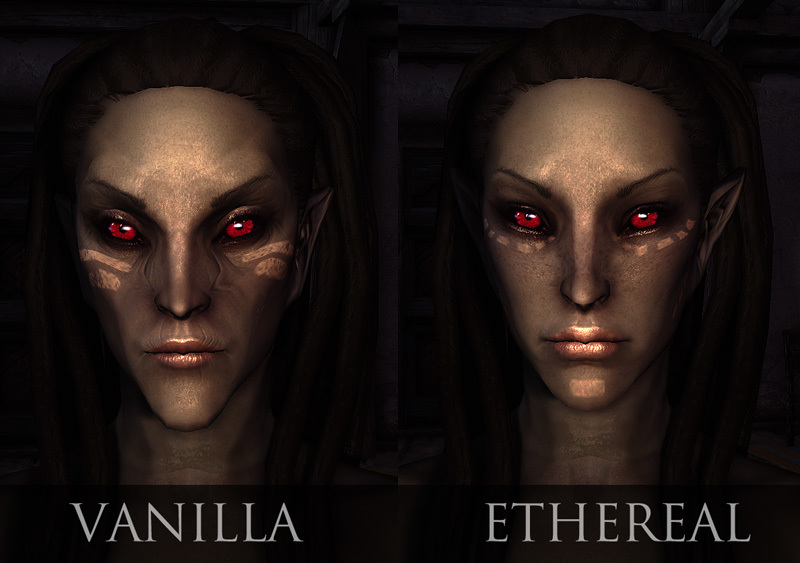 Ethereal Elven Overhaul is a comprehensive revamp of the elf races of Skyrim. It alters every aspect of their facial features to a more appealing look, while remaining faithful to the original work and striving for realism. 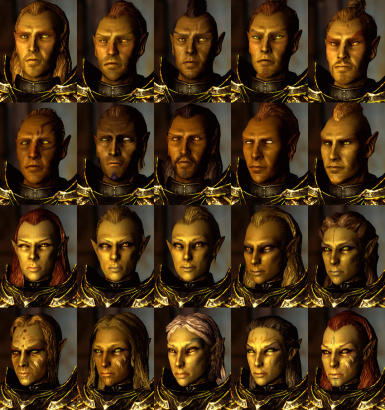 EEO also affects every elven NPC in the game and comes with new presets. 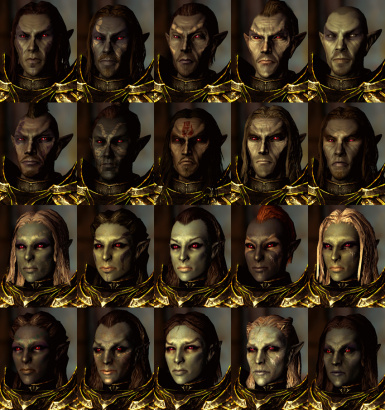 Check out CharGen Extension for tons of extra sliders to edit your character's head with! Covers vanilla races and has an EEO patch available. I contributed to the plugin's development personally and it's an amazing thing. 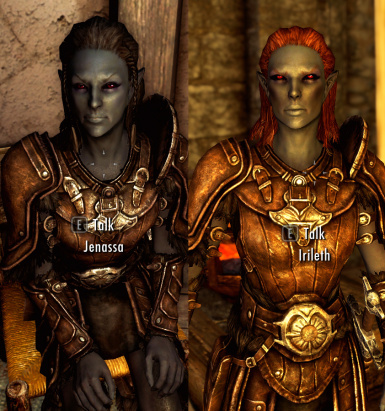 Thordir also made a user patch to cover Dawnguard and Dragonborn NPCs, you can find it here. All my mod assets are also modder's resources. As I've built practically everything in my works from vanilla, any art asset from any mod that I've released (even ones that aren't currently up) can be used without needing to ask my specific permission. Please credit me for it if you release something though! Mod translations and user patches can also be freely made and distributed and you don't need to even ask. 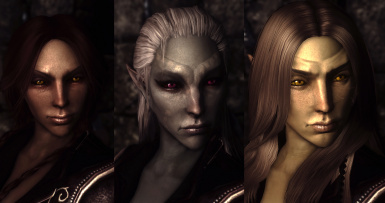 EEO is compatible with all body, skin and hair mods that would affect vanilla elves alike. The provided screenshots attempt to emulate a vanilla look with the mod, and your end results will slightly vary according to which skin you have in place. EEO provides its own normal maps that cannot be overwritten by custom skin mods. 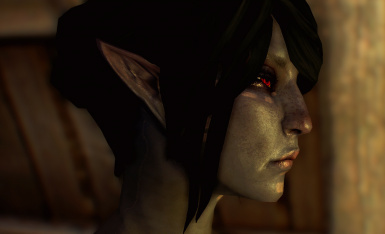 Look here for tips and general guidelines on making gorgeous elf ladies! As EEO has a large amount of files in a variety of locations, it is recommended you install it via the Nexus Mod Manager. A manual installation is easy and most possible, but should you need to remove the files later, it might prove trickier to hunt down every individual asset. Installation/uninstallation instructions are provided with the mod. 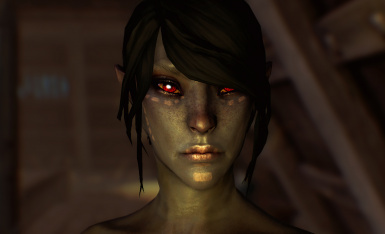 -Better FaceGen or Enhanced Character Edit do not work with EEO characters. -Extended Slider Colours may cause the elves' warpaints to vanish and a plethora of other issues. RaceMenu however works great! -NPC overhauls don't work with EEO. -EEO's optional face skin may cause a visible neck seam when used with non-Vanilla derivative body textures. If you use a custom body texture, prioritize using a face texture purpose-built to match it.